EWG’s analysis found that the life cycle carbon intensity of cellulosic ethanol from switchgrass was 47 percent lower than that of gasoline. Ethanol made from corn stover – the leaves and stalks that remain in the field after the grain is harvested – has a life-cycle carbon intensity 96 percent lower than gasoline’s. By contrast, studies have found that the life cycle carbon intensity of corn ethanol is greater than that of gasoline (Mullins et al. 2010, EPA, 2010a). Yet current federal policies strongly favor the production of conventional biofuels such as corn ethanol at the expense of lower-carbon alternatives. Congress should reform the federal Renewable Fuel Standard to eliminate the mandate to add corn ethanol to gasoline and should further reform the standard to accelerate development of biofuels from lower-carbon feedstocks. At the same time, Congress should adopt new protections to ensure that fuels from grasses and crop waste also meet soil and water quality goals. If Congress fails to act, EPA should employ the “reset” provisions of the Renewable Fuel Standard to gradually reduce the mandate for corn ethanol and encourage development of lower-carbon second-generation fuels. Conventional corn ethanol, which is largely exempt from regulations on greenhouse gas emissions. Advanced biofuels such as sugar cane ethanol, which must have life-cycle emissions no more than half those of gasoline. Cellulosic biofuels such as ethanol from switchgrass and corn stover, which must have life-cycle emissions at least 60 percent lower than gasoline’s. To date, the RFS has largely driven development of corn ethanol. Between 2007 and 2014, corn ethanol production increased from 6 billion gallons to 14 billion gallons. This rapid increase in corn ethanol production increased the price of corn, stimulating more corn production and more plowing up of land for crops. Conversion of grasslands and wetlands to produce corn for ethanol releases carbon stored in the soil into the atmosphere. Growing corn also requires a lot of fertilizer, some of which runs off into local waterways, making drinking water more expensive to treat and threatening aquatic life (Donner & Kucharik, 2008). Fertilizer use also results in emissions of nitrous oxide, a powerful greenhouse gas. The Environmental Protection Agency found that corn ethanol production mandated by the Renewable Fuel Standard would increase greenhouse gas emissions until 2036 (EPA, 2010b) – even though EPA assumed the RFS would not stimulate domestic land conversion to grow more corn and soy. The RFS stipulates that in order to qualify as a renewable feedstock, a crop cannot be grown on recently converted land. But, a University of Wisconsin study found that between 2008 and 2012 about 7 million acres of land were plowed up to grow more crops, and the RFS was a key driver of this conversion (Lark et al. 2015). This means that to date the mandate for corn ethanol has contributed to more climate-warming emissions than if there were no requirement and will do so for at least another 20 years. Given EPA’s estimate that corn ethanol is 30 percent more carbon-intensive than gasoline (EPA, 2010a), EWG estimated that the 14 billion gallons of corn ethanol produced in 2014 resulted in 27 million more tons of carbon than if we had used gasoline (Cassidy, 2015). In addition, the Renewable Fuel Standard has failed to spark development of cellulosic biofuels. Cellulosic biofuel production has not met the optimistic targets set by Congress in the RFS (Table 1). In 2013, about 820,000 gallons of cellulosic fuels were produced, a tiny fraction of the billion gallons mandated. In 2014, about 33 million gallons of cellulosic fuels were produced, but most came from compressed and liquefied natural gas from organic wastes (EPA, 2015). EWG commissioned Dr. Richard Plevin, a UC Davis research scientist and Gouri Shankar Mishra a PhD Candidate at UC Davis to assess the global changes to agricultural emissions and land use associated with the production of switchgrass and corn stover using the Global Change Assessment Model, or GCAM, developed by the Pacific Northwest National Laboratory (Clarke, Lurz et al. 2007; Calvin, Clarke et al. 2011). 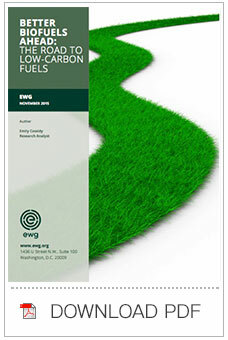 In order to calculate the life-cycle carbon intensity of these fuels, EWG included previously published emissions associated with on farm energy use, transportation, and ethanol production. EWG also factored in the emissions savings from electricity produced from unused portions of the feedstock (Wang et al. 2012). These emissions were added to the GCAM results to estimate the life-cycle carbon intensity of these fuels in comparison to that of regular gasoline as formulated in 2014. The EPA’s 2010 analysis of life-cycle carbon intensity used a baseline of gasoline as formulated in 2005. But the California Air Resources Board estimates that between 2005 and 2014, the carbon intensity of gasoline increased by roughly five percent – from 93.1 grams of carbon dioxide equivalent per megajoule of energy produced, or CO2e/MJ, to 97.5 grams – because of increased use of high-carbon oil extracted from tar sands (CARB, 2014). We found that the life-cycle carbon intensity of switchgrass ethanol is 47 percent lower than gasoline’s. We estimate switchgrass ethanol’s life-cycle emissions to be 52 grams of CO2e/MJ, more than double the EPA’s 2010 estimate of 25.8 grams (Figure 1). Although our analysis concluded that switchgrass ethanol will not meet the 60 percent emissions reduction requirement of the RFS, these results show that switchgrass ethanol is significantly better for the climate than gasoline or corn ethanol (Figure 2). 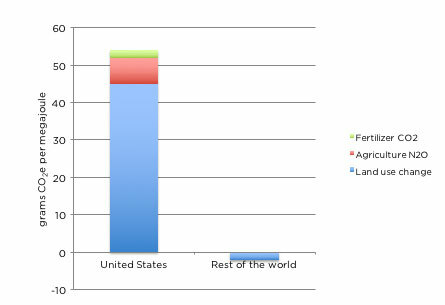 Source: EWG and EPA 2010a. Source: Carbon intensity of gasoline from CARB 2014. Corn ethanol from EPA 2010a and switchgrass and corn stover ethanol from EWG analysis. In particular, our analysis suggests that emissions from domestic land use change associated with switchgrass ethanol could be much greater than estimated by the EPA. Our analysis found that growing more switchgrass results in lots of carbon released into the atmosphere from land conversion (Figure 3). Growing switchgrass provides other important environmental benefits. Switchgrass can be grown on land that is unsuitable for food and animal feed crops (Tilman et al. 2009). Switchgrass can also reduce fertilizer pollution of local waterways. One study found that growing grasses on just 10 percent of Iowa land could reduce soil losses by 90 percent, which would also significantly reduce nitrogen and phosphorous fertilizer runoff (Moore et al. 2014). Corn stover ethanol has greater potential than switchgrass ethanol to reduce carbon emissions. Because corn stover is typically left on a harvested field or tilled into the soil, it requires no additional land to produce ethanol feedstock. Our analysis found that corn stover ethanol has a carbon intensity of 3.7 CO2e/MJ, which is 96 percent lower than the life-cycle intensity of gasoline. This carbon intensity is also lower than EPA’s estimate of 7.1 CO2e/MJ (Figure 1). However, using stover as feedstock rather than leaving it in the field does present other environmental risks. Corn stover acts as a barrier to rain and wind; removing too much stover exposes soil to the elements, increasing erosion. For this reason several studies caution not to remove more than a third of the stover from soil (Andrews, 2006, Kenney et al. 2013; Wilhelm et al. 2007). Any estimate of the carbon intensity of biofuels comes with uncertainty. The yields of switchgrass affects how much land is needed to grow the feedstock, and using more land increases the fuel’s carbon intensity. In addition, assumptions must be made about whether using land for ethanol feedstocks will displace land for food production. Under different parameter values, results for corn stover ethanol varied by plus or minus 0.5 grams of CO2-equivalent emissions per megajoule of energy. But the results for switchgrass ethanol had more variability – plus or minus fifteen grams of CO2e/MJ. However, only a small fraction of the varying results for switchgrass ethanol achieved a 60 percent emissions reduction compared to gasoline. Eliminate the corn ethanol mandate. Although refiners should be allowed to blend corn ethanol to meet market demand, Congress should no longer require it. The limited market for ethanol is saturated by corn ethanol, so elimination of the corn ethanol mandate will create a powerful incentive for greater investment in cellulosic ethanol. Extend the cellulosic biofuels mandate. Congress should set achievable goals for the amount of cellulosic biofuels that must be blended into gasoline in order to facilitate development of these fuels. But Congress should also extend the Renewable Fuel Standard beyond 2022 to provide more certainty to investors. Update sustainability criteria. Congress should reform the Renewable Fuel Standard to require consideration of the impacts of biofuels production and use on air, water and soil quality, not just on greenhouse gas emissions. To guard against erosion, the standard should limit the amount of stover that can be removed from cornfields. If Congress fails to act, the EPA should use its existing authority to reduce the amount of corn ethanol that will be blended into gasoline in 2016, and should use the “reset” provisions of the Renewable Fuel Standard to gradually eliminate the mandate for corn ethanol and spur the development of second-generation biofuels. Clarke, L. et al (2007) Model documentation for the MiniCAM climate change science program stabilization scenarios: CCSP product 2.1a. PNNL Technical Report. PNNL-16735., Pacific Northwest National Laboratory. Donner, S. D. & C. J. Kucharik (2008) Corn-based ethanol production compromises goal of reducing nitrogen export by the Mississippi River. Proceedings of the National Academy of Sciences 105.11: 4513- 4518. Fargione, J. E. et al (2010) The ecological impact of biofuels. Annual Review of Ecology, Evolution, and Systematics, 41, 351-377. Jin V. L. et al. (2015) Twelve Years of Stover Removal Increases Soil Erosion Potential without Impacting Yield. Soil Science Society of America Journal, 79(4), 1169-1178. Wang, M. et al. (2012) Well-to-wheels energy use and greenhouse gas emissions of ethanol from corn, sugarcane and cellulosic biomass for US use. Environmental Research Letters 7.4: 045905. W.W. Wilhelm et al. (2007) "Corn stover to sustain soil organic carbon further constrains biomass supply." Agronomy journal 99.6: 1665-1667. A fuel’s life-cycle carbon intensity refers to the greenhouse gas emissions per unit of energy in the fuel, counting emissions from all processes from raw materials extraction to fuel production and use, as well as global changes to land use and agricultural emissions induced by increased biofuel production. 14.8 billion gallons of corn ethanol were exempted from meeting an emissions reduction target when the EPA grandfathered existing ethanol plants and those undergoing construction. This is explained on page 147 of EPA’s Regulatory Impact Analysis (2010b). EPA discusses corn ethanol’s “payback period” on page 483 of the Regulatory Impact Analysis (2010b). Because of the large increase in carbon emissions from land use conversion, EPA estimated the use of corn ethanol won’t “pay back” those emissions until 2036. An analogy is that solar panels cost a lot up front, but pay back some of the cost every month you use them. We chose these fuels because EPA estimated that by 2022 crops such as switchgrass would generate about half of the 16 billion gallons of cellulosic fuels mandated by the RFS. 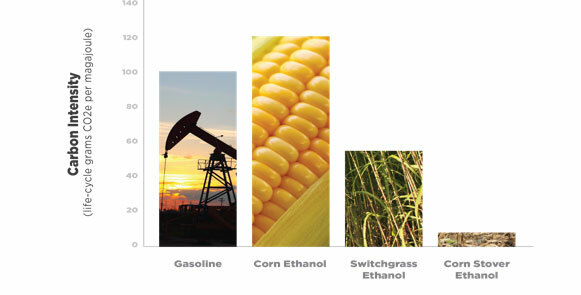 EPA estimated that by 2022 use of corn stover would be used to produce 4.9 billion gallons of fuel (EPA, 2010b). Wang and colleagues estimate that emissions associated with ethanol production, farming, transportation, and combustion are 17 grams CO2e/MJ for both switchgrass ethanol and stover ethanol. 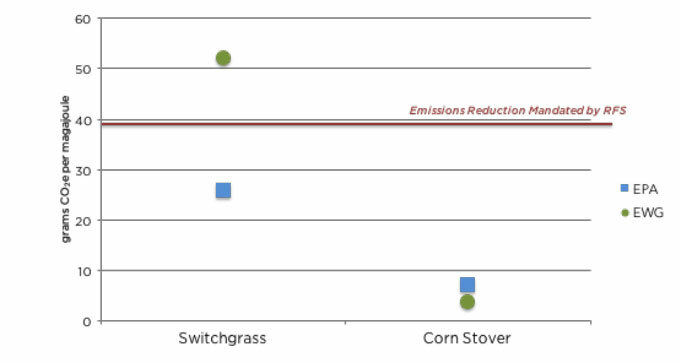 The emissions savings from co-produced electricity are 17 grams CO2e/MJ for both switchgrass and stover ethanol (2012). Stover provides valuable soil nutrients such as carbon, nitrogen, phosphorous, and potassium. To replace these nutrients, more synthetic fertilizers would have to be produced, which requires energy. A previous study estimates that for every metric ton of stover, replacing the nutrients removed from soil will require 8.5 kilograms of Nitrogen fertilizers, 2.2 kilograms of phosphorous fertilizers, and 13.3 kilograms of potassium fertilizers (Wang et al. 2012). We accounted for the energy required to replace these nutrients, which added six grams of CO2e of emissions to our estimate of corn stover ethanol’s carbon intensity (Wang et al. 2012). Most vehicles, boats and small engines are not designed to run on gasoline that contains more than 10% ethanol, and most gasoline pumps are not designed to deliver blends of gasoline that contain more than 10% ethanol. As a result, there is a practical limit – known as the blend wall – on the amount of ethanol that can be blended in gasoline.